This unusual postcard, dated 1906, shows the clock tower in The Square during its construction. The scaffolding and hoardings are still in place, the stonework appears to have been completed but the clock faces and weather vane are yet to be added. In the background we can see the buildings of Abbey End as they appeared before they were destroyed in the blitz of November 1941. According to the 1939 Kelly’s Directory listings quoted by Robin Leach’s WWII website these included A & F Hanson, Music dealers; Daniels, Trustam and Ward, Dentists, Gilbert Morgan, Wine & spirit merchant and Arthur J Cooke, Grocer just shortly before their destruction. Robin Leach’s book Kenilworth People & Places vol 1 (Rookfield Publications, 2011) contains a detailed account of how George Marshall Turner, a wealthy local owner of a successful Birmingham based drapery business, became a benefactor to the town. He funded the construction of the clock tower in memory of his late wife. The finished clock tower was unveiled in January 1907. 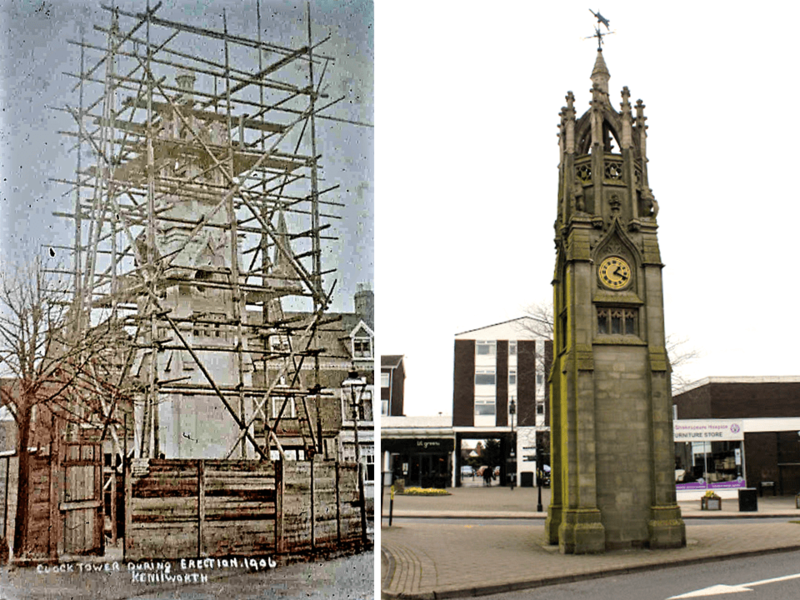 Following the destruction caused by the Luftwaffe parachute mine in November 1941 the crown of the clock tower was deemed unsafe, and was pulled down using the local fire ladder. Thankfully, the clock tower was restored. In 1973 the stone crown was reinstated and in 1974 a local blacksmith constructed a replacement weather vane.